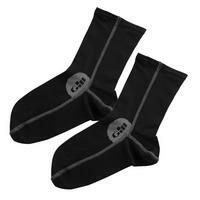 Super lightweight yet highly thermal socks for cooler sailing conditions. The material is naturally Hydrophobic so water is repelled away from the fabric ensuring the garment doesn't get heavy and damp when worn in wet conditions. TECHNOLOGY: 4-way stretch wicking polypropylene fabric that is non-absorbent and actively repels water for warmth and comfort. FEATURES: Soft, stretchy fit for freedom of movement. FEATURES: Flatlocked construction to help prevent chafing.